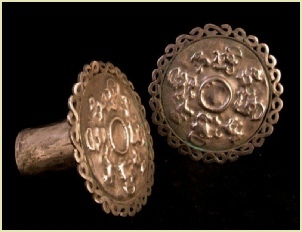 A choice pair of silver plated Chimu/Inca ear-spools. Anthropo-zoomorphic repousse decorations surround the center ring. Outer parameter consists of eternity symbols. Excellent overall patina. Peru, AD 1400-1532. Measures 8,57cm in diameter. Custom metal mounting. These size earspools in silver and gold were known to be worn by the upper class nobles and referred to as “orejones” (big ears) by the Spanish conquistadores (Guaman Poma 1615; Cobo 1983:208). Provenance: Ex T. Funk, Melbourne, Florida collection. Inca Metalwork. The science of metallurgy was more advanced in Peru than anywhere else in the Americas. Deep mining was practiced, as well as a kind of smelting to remove metal from raw ore. Copper and tin were combined to produce bronze, which made stronger weapons and tools. Metalworkers also knew about casting, soldering, and riveting. Deposition gilding and silvering were undertaken in the Northern and Central Andean regions using an elaborate technique that left a thin layer of gold or silver on the surface of a copper or bronze piece. The first step was to dissolve particles of the noble metal in an aqueous solution also containing acidic mineral compounds; the liquid was then neutralized by adding lime and the piece was submerged in the resulting solution, where some of the precious metal was deposited on its surface. This technique is also known as electrolytic replacement gilding. The result is a thin, fragile layer of gold or silver that is heated to bond it to the surface of the metal and then polished to enhance the luster of the finished piece.